Last week I presented a paper at the North American Conference on Media, Film & Cultural Studies. The conference was held in Providence, Rhode Island and hosted by IAFOR. 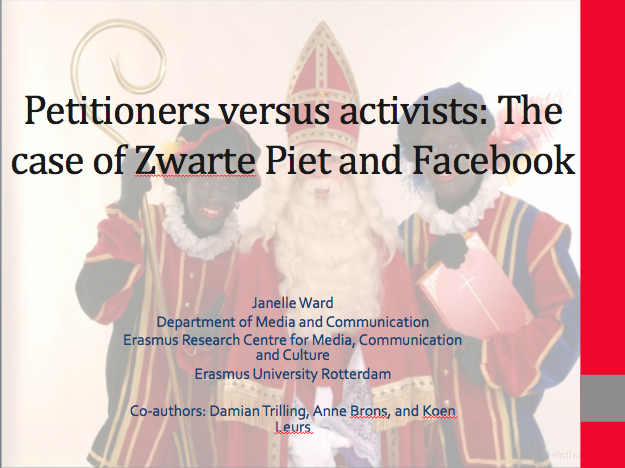 The research I presented looked at two popular Facebook pages related to the Zwarte Piet debate in the Netherlands. The abstract is below, and the slides are available on SlideShare. Zwarte Piet, literally translated as Black Pete, has created growing controversy for its racist undertones in the Dutch celebration of Sinterklaas. This paper looks at how Facebook users engage with the debate by quantitatively examining two Facebook pages: “Zwarte Piet is Racisme” (Black Piet is Racism, or ZPIR) and the pro-Zwarte Piet page called “Pietitie.” Analysis shows that ZPIR is a page oriented towards longer-term engagement. User engagement on ZPIR is also more intensive compared to Pietitie, which is very much an incident-based page. We argue that in this case, interpersonal discussion is more developed on a page designed to protest an issue, which may promote both civic participation and political activity of its users.